A Pre-defined ruleset is a set of access rights and protection settings that has been saved and can be re-used and deployed on multiple applications or groups. Each ruleset is comprised of a number of 'Rules' and each of these 'Rules' is defined by a set of conditions/settings/parameters. 'Predefined rulesets' is a set of rulesets that concern an application's access rights to memory, other programs, the registry etc. Note: This section is for advanced and experienced users. 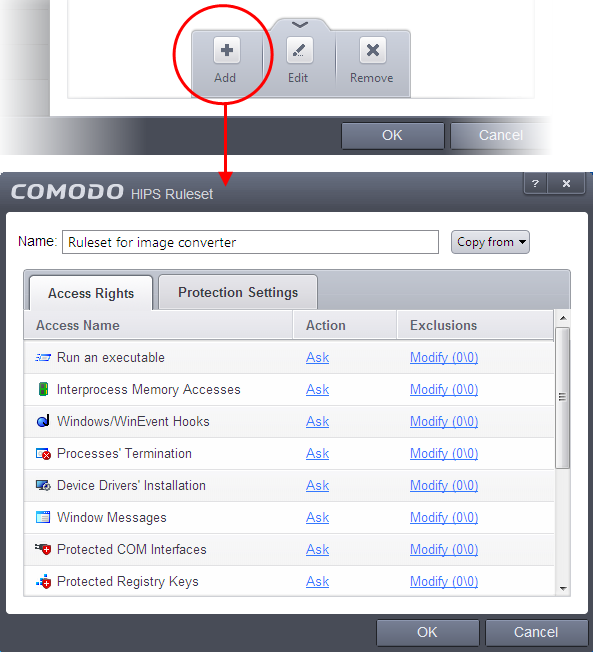 If you are a novice user to Comodo Internet Security, we advise you first read the Active HIPS Rules section in this help guide if you have not already done so. Although each application's ruleset could be defined from the ground up by individually configuring its constituent rules, this practice may prove time consuming if it had to be performed for every single program on your system. 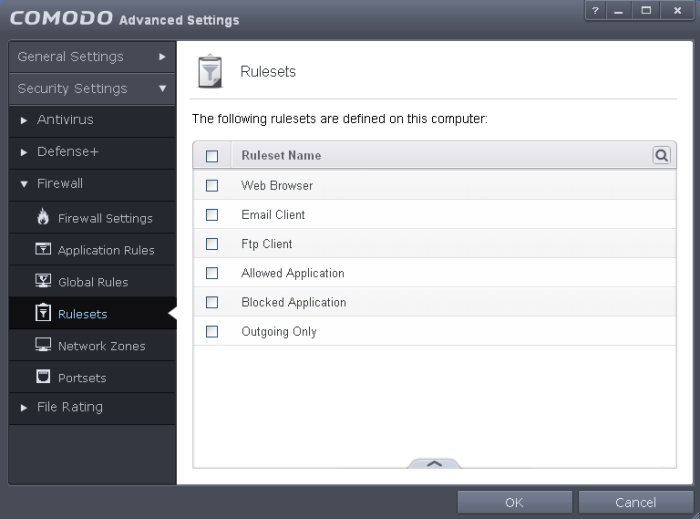 For this reason, Comodo Internet Security contains a selection of rulesets according to broad application categories. Each predefined ruleset has been specifically designed by Comodo to optimize the security level of a certain type of application. 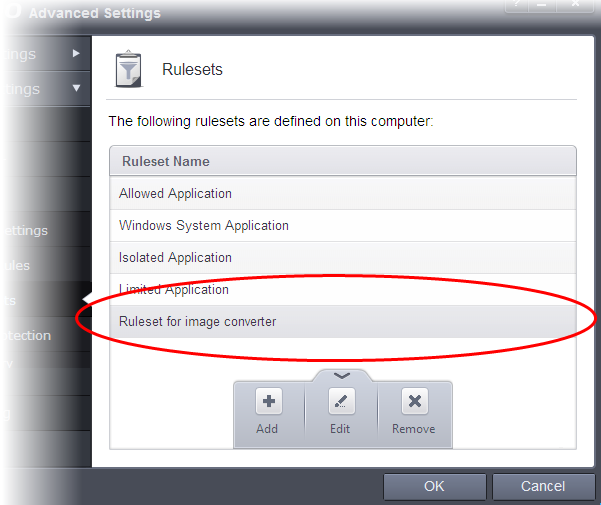 Users can, of course, modify these predefined rulesets to suit their environment and requirements. Navigate to: Advanced Tasks > Security Settings >Defense+ > HIPS > Rulesets. There are four default Rulesets listed under the 'Rules' column. You can use the search option to find a ruleset in the list. Enter partly or fully the name of the ruleset in the search field. Select the Ruleset, click the handle from the bottom of the interface and choose 'Edit' from the options. From here, you can modify a ruleset and, if desired, make changes to its 'Access Rights' and 'Protection Settings'. Any changes you make here are automatically rolled out to all applications that are currently applied with the ruleset. Click up arrow at the bottom of the interface and choose 'Add' from the options. Enter a name for the new ruleset. To customize the Access Rights and Protection Settings as per the requirements of this new rule set, follow the procedure explained in the section Use a Custom Ruleset. Click OK to save the new ruleset. Once created, your policy is available for deployment onto specific application or file groups via the Active HIPS Rules interface.